The Essential Parent formula feeding course is presented by paediatric dietitian, Melissa Little and written by Shel Banks an International Board Certified Lactation Consultant. The material is advised by the Royal College of Paediatrics and Child Health, and the UNICEF UK Baby Friendly Initiative. If you’ve chosen to formula feed, or bottle feed, your baby, it’s important to know how to keep the bottles, teats and other equipment properly sterilised. This will reduce the risk of your baby getting a tummy bug. Babies with gastroenteritis can become dehydrated very quickly which can be dangerous. Knowing how to store expressed milk, or formula milk, properly is very important for the same reason. Just as important is learning how to keep the bond, or attachment, going when you are formula feeding or bottle feeding. Simple tips from the experts show you how to keep that beautiful bond going. Last but not least – a demonstration on how to formula feed, or bottle feed, recognising your baby’s feeding cues in a sensitive way and responsive way. Knowing these skills can really help to reduce the risk of your baby becoming obese later in life. How much milk will my bottle fed baby drink? 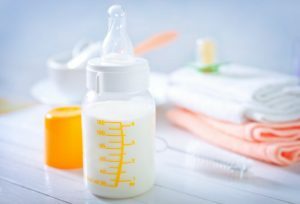 What do I do if my breastfed baby won’t take a bottle? How to burp my bottle fed baby? How often should I bottlefeed my baby?